Eugenia caryophyllata. Clove leaf essential oil is indicated for the treatment of acne, bruises, burns, cuts and respiratory problems due to it’s antiviral properties. Clove comes from the Latin word ‘clavus’ which means nail-shaped. Clove leaf essential oil is extracted from the plant with the botanical name of Eugenia caryophyllata. It is native to Indonesia and the Malacca Islands. Clove leaves are used in a cigarette called kretek in Indonesia. Kreteks are smoked throughout Europe, Asia and the United States. Clove oil can also be extracted from the bud of the plant. What does clove leaf essential oil smell like? A warm, strong spicy smell. Where has clove leaf essential oil been sourced from? This particular clove leaf essential oil originates from Indonesia. How is clove leaf essential oil extracted? Clove leaf essential oil is extracted by steam distillation. What other oils blend well with clove leaf essential oil? Clove leaf oil blends well with basil, bergamot, black pepper, clary sage, cinnamon, citronella, nutmeg, peppermint and ylang ylang as well as citrus oils. How can I benefit from clove leaf oil? 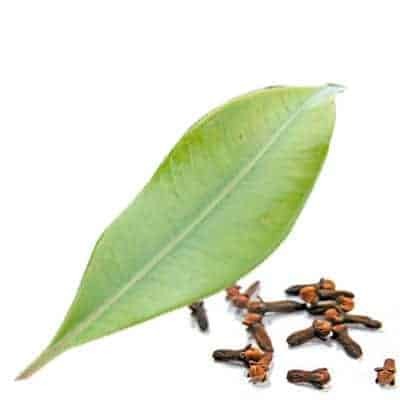 Clove leaf essential oil is indicated for the treatment of acne, bruises, burns, cuts and respiratory problems due to it’s antiviral properties. It is also an effective antiseptic as well as a treatment for digestive problems like diarrhoea, flatulence and parasites. It can provide some pain relief when you have a toothache or mouth sore. Clove oil can also be beneficial for relieving stress and helping with anxiety. It even has aphrodisiac properties and serves as a natural insect repellent. Because clove leaf oil is a very potent oil, it must be used with care. The concentration should be below 1%. For concentrations higher than that, skin irritation as well as respiratory irritation may occur. It is also not recommended for use by patients with liver and kidney problems, prostate cancer, hemophilia, for those using blood thinners and for pregnant women. Consult your healthcare professional or a certified aromatherapist for further advice. 100% Therapeutic Clove leaf essential oil.